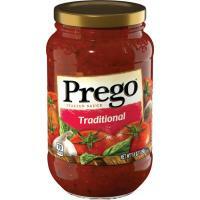 Prego Traditional Italian Sauce gives you the rich, sweet flavor of vine-ripened tomatoes balanced with savory herbs and seasonings. Perfect as is, or use it as a base for your own homemade pasta sauce. Use this classic to transform pantry ingredients into plenty of family-pleasing recipes.